“At the end of the day, I just want to be myself and create things that make me happy. 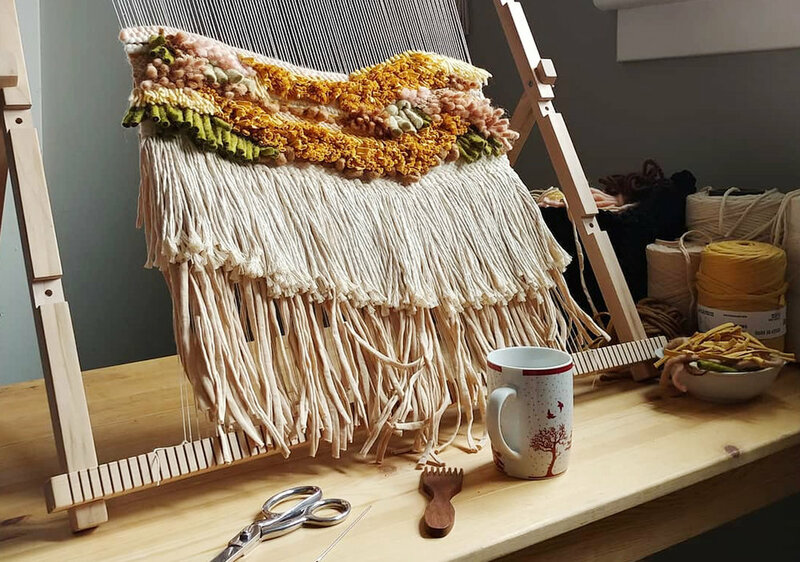 If in the process, it makes other people happy, then there’s really nothing else I can ask for.” We think this nicely encapsulates a goal every craft should strive for… which is exactly what weaver, Annie-France lives by. Weaving became Annie’s source of comfort during a period she felt lost and overwhelmed, and later brought out the extrovert side of her. In just a month, Annie started WOVVVEN, where she sells her beautiful woven tapestries. We had a chat with this KOEL Kid on her creative process, favourite design and more. 1. Tell us more about your background and what led you to choosing weaving as a craft? My name is Annie-France and I’m 28 years old. I currently live in the beautiful city of Ottawa in Canada. I work during the day in an office and weave at night. Weaving truly made its entrance into my life in February 2018, about 6 months after my son Emery was born. Becoming a mother was such a whirlwind of emotions and at the beginning I felt lost and overwhelmed. During the numerous sleepless nights, I found myself browsing Instagram and gradually, pictures of weavings started appearing onto my feed. It really sparked my curiosity and I decided that I wanted to give it a try. I got the materials I needed, and soon after that, WOVVVEN was born in March 2018. 2. What makes you a KOEL Kid? It’s funny because as an introvert, I’ve always wanted to just blend in. What has happened in the last year with my work is the opposite to me, it is mind blowing. At the end of the day, I just want to be myself and create things that make me happy. If in the process, it makes other people happy, then there’s really nothing else I can ask for. What sets me apart from the rest? It’s an interesting question to answer. Maybe it is my versatility? Or perhaps it is my love for texture and the way I play with colors? When I weave, I take my time. Whether I’m going for a certain vibe or a feeling, a lot of thought goes into what I create, and I believe that people notice it and appreciate it. 3. Share with us the creative process behind each of your projects. I usually get an idea for a piece while I’m busy doing something else. At that point, I almost always know the color palette I’ll be using. It’s either colorful or very neutral. Most of the time, I weave literally in silence, without any distractions. It’s a habit I picked up back when my son was younger, and I was weaving during his naps. Between the moment I come up with an idea and the moment my loom is warped, the ideas I’ve had in mind have already evolved into other ideas, and I usually end up staring at my loom for a little while, not sure how to start. That’s when the magic happens. I always try to follow my own advice, which is to simply start and trust my hands. 4. Pick one of your favourite designs and answer these quick questions. The inspiration behind this design is... My everlasting longing for Spring. This winter has been brutal! The dream store in which I would like to stock this design is... Good question! For anyone to show even a little interest in my work is already a big deal. So whoever you are out there, if this piece is calling you, you are the dream home for this piece. Which celebrity house can you picture your design at... I’m on a huge Emily Blunt kick, so there, I said it. Emily, what do you say? If this design made it big, I would... most likely scream internally and be in shock for a little while. If this design could talk, it would say... I got that sunshine in my pocket, got that good soul in my feet! 5. Great things take time, so how much has changed since you first started weaving and where do you see it in the next five years? When I started weaving a year ago, I never expected anything out of it. It was just a way for me to do something for myself while also figuring out how to wear all my different hats. In the last year, I’ve found my own style but most importantly, I’ve found what I wanted to do with my life. A real passion that I can share with other people. In the process, I’ve also discovered an incredible community and developed friendships with people I would have never met if it wasn’t for weaving. I’m so thankful for this last year and if the next five years can be spent exploring ideas and sharing my love of weaving and fibers with the world, then I am more than content.